I know the contest has expired, but what about the soup? 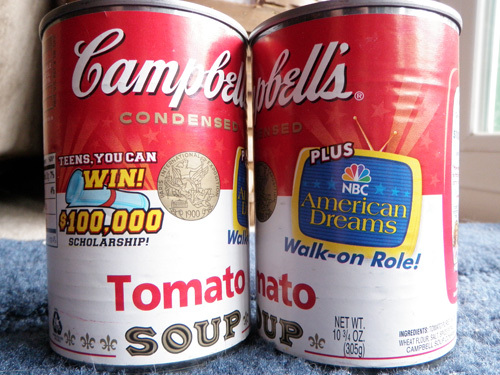 I was less interested in the tomato soup than the contest advertised on the side where you could win a walk-on role on the TV show American Dreams. If you’re not familiar with American Dreams, that’s probably because IT WAS CANCELED IN 2005. I’m pretty sure that contest has expired, and looking at the red stamps that say “August 2006” on the bottom of the cans, I’m pretty sure the soup has expired too. This is one American dream that won’t come true. ETA: I just discovered when spell-checking this entry that both “canceled” and “cancelled” are considered proper spellings. The former is American, whereas the latter is British, but since this post is about American Dreams, I went all American. Later: Going to Wordcamp! Have fun at BlogHer without me! Earlier: Help a reader out: How do you get a spouse to lose weight with you? I LOVED that show!! If I ate tomato soup, I would have been so excited back then that I probably would have bought cases and cases to try to win that walk-on! my mother has more expired food in her house than anyone i know. she lives by herself now but still shops at costo/bj/warehouse stores. When I was little I used to stay at my Grandma’s every summer. As she got older I began to cook for her. I was once looking through her cupboards for something to make and found some canned mixed vegetables- expiry date May 1967! This was in the early 90’s! It even had a price sticker with ‘6d’ on it- it pre-dated UK decimilisaition in 1971! God bless her! The soup will be fine as long as the can isn’t damaged, though. Dude, you know when McCormick came out with that ad a few years ago? It had pictures of all the different years of their products and we found 40 year old spices in my dad’s cabinet. It was a genuine “if you haven’t used it by now you don’t need it” experience. We recently had to clean out my mom and dad’s garage. Long story short, my mom passed away in 2005 and nothing in that garage had been touched. There were cans of food from like 1980. A bottle of V-8 was practically black. hahhaha! i take it you guys arent big tomato soup drinkers. Cancelled is also Canadian but I encourage all to support their culture so… cancel away! I found recently salad dressing in my mom’s fridge that expired back in 2005. That means, it was probably there a year before. So, since 2004. Which is like, really gross. Ew. (1) i loved that show! (2) i was recently at my grandparents and in cleaning out their bathroom cabinets, we found a shoe polish where the rebate offer on the box had expired in 1959. truly. I often experiment with exotic dishes and had to buy some exotic ingredients that could not be used for any other dish except the one which sent me to hunt it down in the beginning. So, although exasperating, I always end up having more than enough expired food to throw away and make me feel guilty about. When I was visiting my grandmother last winter I saw a box of muffin mix in a flavor I had wanted to try and mentioned that I was a bit sad it was going to charity so I couldn’t try it. She told me the muffin mixes were a bit stale so we could keep them if I wanted to make them. Somehow “a bit stale” turned out to mean they had expired a year ago!